Rotary blower discharge silencers are some of the most essential components to high performance in all the blower systems. Most people believe that the discharge does not create a lot of noise as compared to the inlet, which is not correct. The discharge noise and high frequency pulsations are common at the outlet and can be responsible for the tremendous destruction of systems operating under very high pressure and discharge velocities. The reason behind this is that the above mentioned components are normally contained in a closed system. The positive rotary blower discharge silencer does not compress the medium it carries from the blower inlet to the discharge side of the blower. The compression phase takes place when the line pressure builds up at the open port. At this stage, compressed air is pushed into the line. This action results in very steep wave forms that are normally destructive to piping any other equipment, if not well taken care of. There are some very important design considerations in building these systems including discharge displacement and speed. A proper evaluation of these two parameters results in a system that reduces the havoc that would otherwise be caused if they were overlooked. They help in curbing the effects of the air flow involved. This is because the pulsation and vibration caused by the air flow out of a constricted area is very high, and if not well handled, the destruction caused can be very costly. Having rotary blower discharge silencers installed by Pathfinder Systems will help a great deal in allowing the system to operate in harmony. Secondly, high frequency air flow causes a lot of noise and vibration which can be a nuisance to the surrounding. The main function of the rotary blower discharge silencers is to reduce these high frequencies by harmonizing the pressure surge of the gas exiting the outlet to the open, in the case of geothermal or any other steam outlet. Silencers also increase the accuracy and efficiency of the system. The noises and vibration caused in the case where silencers are not used is, as a result of turbulence and back pressure, resulting from the air which is passed through a medium, which in the process, tends to cool down causing medium imbalances. If the medium was to be used without being passed through a silencer, issues of inaccuracy would arise. 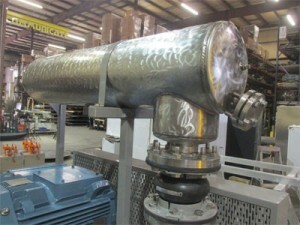 Rotary Blower Discharge Silencers are used to correct this variation.